From the Doritos Locos Taco to the Naked Chicken Chalupa, Taco Bell has long tested the limits of what it can do with core ingredients like meat, cheese, sauces, and tortilla shells. 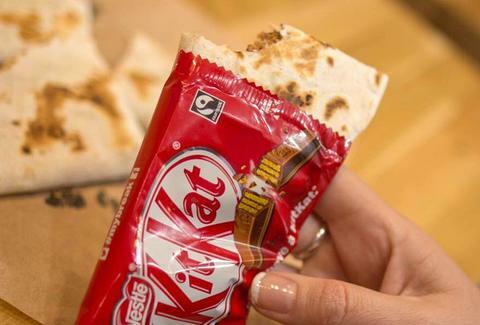 Now, the fast food chain is turning to a surprisingly sweet ingredient for one of its latest stunt foods: Kit Kat bars. Really. On Thursday, T-Bell confirmed it's testing a new menu item it hilariously calls the Kit Kat Chocoladilla, a quesadilla that's literally filled with Kit Kat bars instead of, you know, meat and cheese. Specifically, the new dessert creation features a melty mix of chocolate sauce and Kit Kat bars that comes stuffed into a flour tortilla -- all for a dollar. However, you can only get your hands on one at certain locations in Wisconsin, according to a report by Brand Eating. The news comes just weeks after the chain unleashed new fried chicken filled Crispy Chicken Quesadillas, and about a year after word spread that it was testing a similar Kit Kat-filled quesadilla in the United Kingdom. Although there's no word on if and when the chocolatey quesadillas will hit Taco Bell's menus nationwide, they would join the chain's existing dessert lineup of Cinnabon Delights, Caramel Apple Empanadas, and of course, its classic Cinnamon Twists. 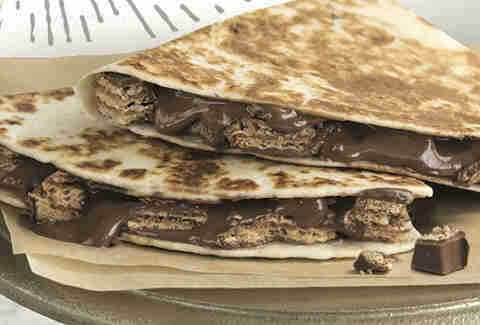 In the meantime, you can always attempt to recreate the Kit Kat-filled quesadilla at home. Seems easy enough -- especially with all the Halloween candy you'll have access to this month. Tony Merevick is Senior News Editor at Thrillist and would probably eat one of these things. Maybe two. Send news tips to news@thrillist.com and follow him on Twitter @tonymerevick.